THE concept of patents is a controversial one, but only if one considers patents on things like thoughts, genetics (nature) and other stuff which doesn’t constitute an invention. There have been studies about cause and effect and they are quite critical of the status quo. The USPTO didn’t always grant hundreds of thousands of patents per year. That’s not because back in the old days there was less innovation and barely any inventions. Now that the law ‘industry’ is large enough to have platoons of lobbyists there’s a push to make everything a patent. That’s a problem. We’re talking about floors here. That’s physical stuff. “A system that loses sight of the importance of patent quality will simply render itself obsolete, over time (perishing in the public mind).”Siemens sells physical things for the most part. This is why Siemens is rarely mentioned here, except when it promotes software patents (that happened a very long time ago and never since). Replacing some farmers with drones so that billionaires like the Waltons can get richer even faster may be an ethical/moral issue (see this response to ‘Innovation Kills Jobs’), but not the patents themselves are an issue. It’s too easy to conflate these two things. The court denied plaintiff’s motion to compel the production of a clawed back deposition exhibit and found the document was privileged. Following a $30 million jury verdict and defendant’s filing for bankruptcy, the court granted plaintiff’s motion to amend its complaint to add defendant’s co-owners as defendants along with alter ego and veil-piercing claims. The court overruled plaintiff’s objections to the magistrate judge’s order partially striking the report of plaintiff’s damages expert. As longtime readers already know, we prefer to concentrate on patent scope rather than matters like damages and privilege. 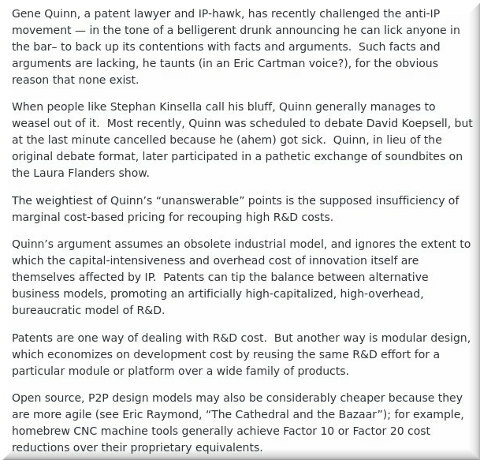 We occasionally see patent maximalists attempting to portray us as “anti-patents” even though we value patent quality, unlike those patent maximalists. A system that loses sight of the importance of patent quality will simply render itself obsolete, over time (perishing in the public mind). So one might think of us as guardians of the system’s integrity rather than its foe. The same goes for copyrights. There’s nothing wrong with copyrights per se, but the way copyright law has evolved is totally detached from the realities of the Internet, public interest, preservation, folklore/culture and distribution.